Yes! Primary students can grow into being independent writers! 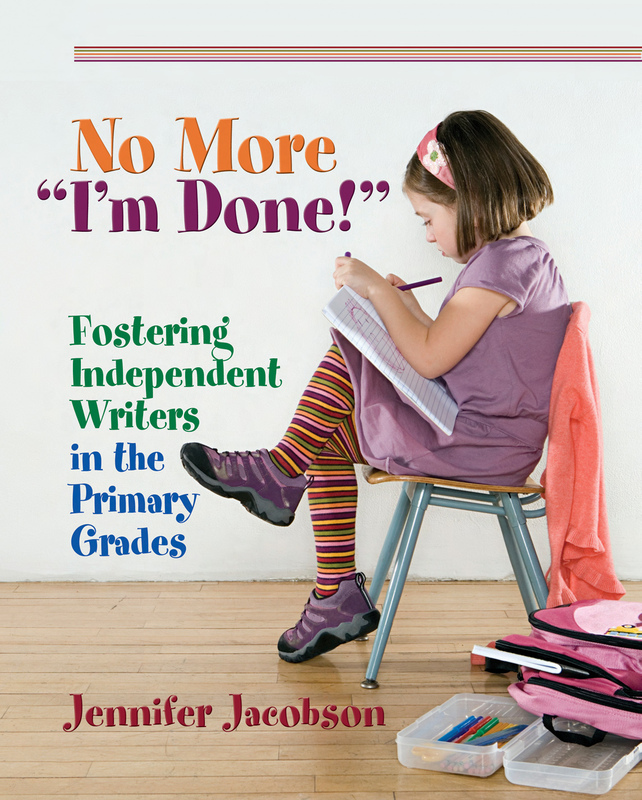 Disregarding the false notion that writing instruction in the primary grades needs to be mostly teacher directed, Jennifer Jacobson shows teachers how to develop a primary writing workshop that helps nurture independent, engaged writers. No More "I'm Done!" demonstrates how to create a more productive, engaging, and rewarding writer's workshop. Jennifer guides teachers from creating a supportive classroom environment through establishing effective routines; shows teachers how to set up a writer's workshop; and provides an entire year of developmentally appropriate mini-lessons that build confidence and, ultimately, independence. Through her years of teaching and consulting, Jennifer has heard all the tough questions about working with primary writers: How do I get my students to sustain for a full writing period? What do I do about the student who can't choose a topic? What about the student who writes about the same thing every day? She answers these questions and many more in the final chapter of the book. Practical, insightful, and, most importantly, effective, No More "I'm Done!" will help primary teachers create a classroom full of writers who possess the skills to succeed in later grades and beyond. As Jennifer says, "You'll know you've succeeded when you have a few available moments and your kids shout, 'Can we write?' And you say, yes." Jennifer Jacobson, a former primary school teacher, is the author of fourteen children's books, including the award-winning Andy Shane and the Very Bossy Dolores Starbuckle, and is also a frequent presenter at library, reading, and writing conferences.